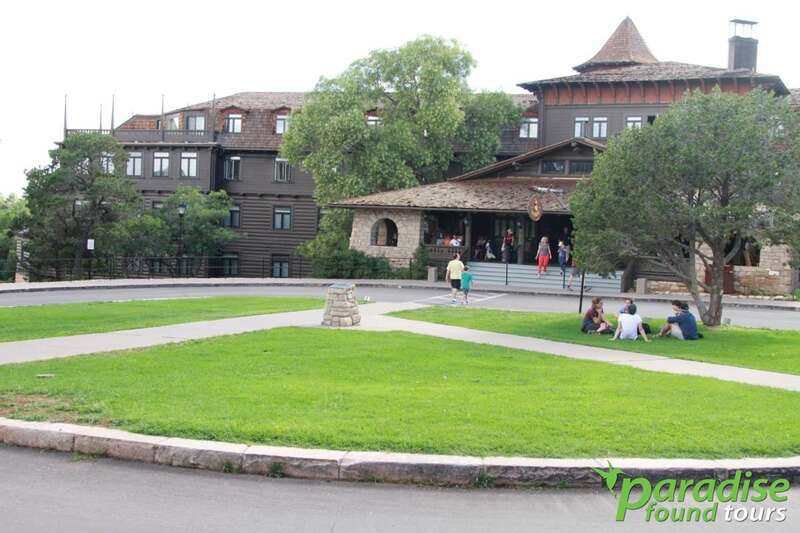 If you ask us, the 78 rooms at the El Tovar Hotel is what defines Grand Canyon Village at the South Rim. It’s majestic and Victorian and, according to local lore, designed after a Swiss Chalet. Most people encounter the El Tovar while exploring the Rim Trail or once they exit the Grand Canyon Railway. The hotel is fronted by a well-manicured lawn that fades into the front porch where the rocking chairs are. The experience starts the minute you step onto the hotel’s covered front porch (replete with rocking chairs!). Inside is the lobby, which has a hunting-lodge feel to it. We say this because of the stuffed animal heads on the wall and the huge fireplace next to the cocktail lounge. Kids always like the buffalo or the moose. It really depends on one’s preference. We usually spend at least half an hour nestled in one of the couches completely enrapt by the fireplace. If you go deeper into the hotel from the lounge you get into a dark stair-alcove. It’s like walking back in time. The rooms are quaint but well appointed. They are quite comfortable and the linens are remarkably lush for place where you are presumably “roughing it.” Soothingly, the stairs still creak. If you plan to stay at the El Tovar book it now. The place sells out at least a year ahead of time. But don’t let that deter you. People cancel all the time so make the phone call, get the “news,” and then call back later that day or over the course of days and BOOM you’re in. We’ve seen this happen more times than we can count. Of course, it helps if you’re party is three or less. Last-minute group bookings are much, much tougher. 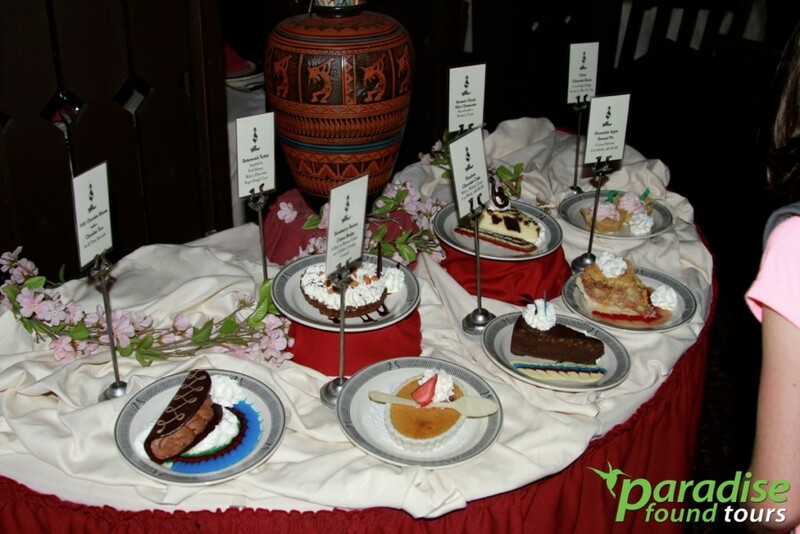 Delicious desserts await the lucky visitor at the Grand Canyon El Tovar Hotel. Things really pick up when it’s time to eat. First, a cocktail at the bar. Go ahead and ask for something “off the wall.” They can do it. Then it’s time to dine. And dine we do! Dining is extraordinary. There’s a main dining room and an outdoor area. Really depends on your mood and budget. Both require showing up early for seats. The traditional dining room distinguished by dark wood and starched white tablecloths. Or go outside and do it plein aire! Just know it’s a popular choice and that many other travelers will have the same inclination. 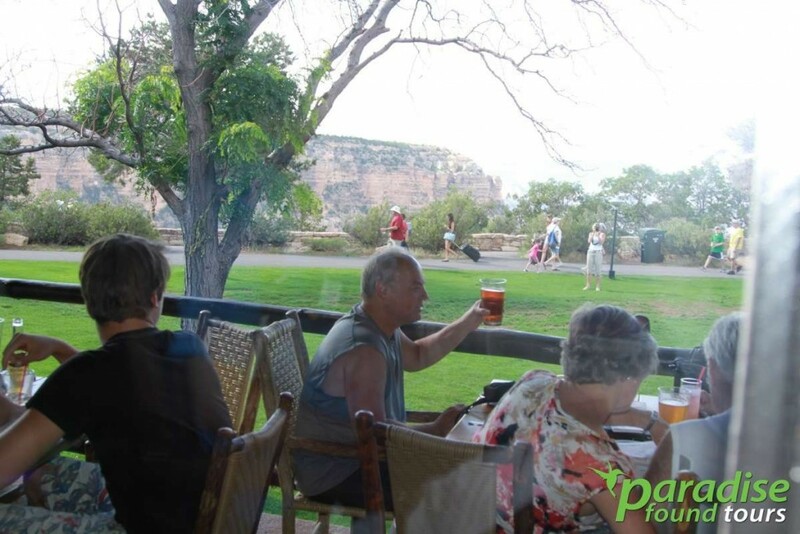 Either way, all dining options are superb, especially after a day of hiking the Bright Angel or South Kaibab Trail. During Christmas, the good folks at the El Tovar fill it with a gigantic, real Christmas tree. The place is transformed into a virtual holiday chateau with a 15 foot tree, lights, garland and bows. It is truly amazing. And Christmas dinner begins at 4:00pm, reservations are always recommended. And on this night the Chef prepares classic dishes such as Prime Rib, Roasted Duck, and Fresh Salmon. Enjoy hot cocoa, play board games in the Mezzanine and have a stress free holiday. For New Year’s Eve, the Chef will prepare a special holiday menu for the guests in addition to their regular menu. Ring in the New Year with a classic meal and good friends in a beautiful environment. Reservations are accepted and encouraged. The El Tovar seems to have it all. There’s the trails, the wildlife, and the natural scenic beauty. The hotel was opened in 1905 as part of Fred Harvey’s ever-expanding empire of hotel/restaurants that dotted railways as they expanded westward. This is one of the oldest lodges at the Grand Canyon National Park. It’s also the grandest. The location of the hotel/lodge is between the Hopi House and the Bright Angel Lodge. Most impressive is its proximity to the South Rim’s edge. You’ll want to take advantage of just how close the El Tovar lodge is to the canyon’s edge. 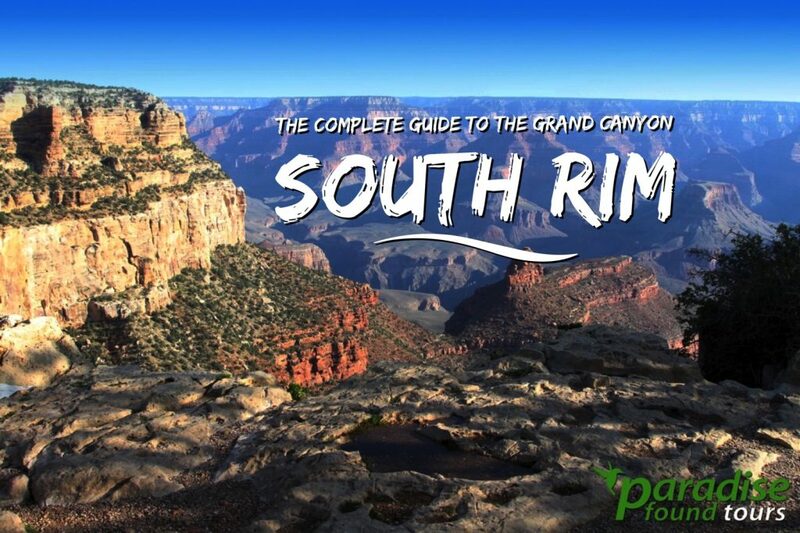 Be sure to take a stroll along the magnificent South Rim Trail. It’s a relatively easy walk and packed with tremendous views. And remember to reserve your stay in advance.